WASHINGTON, D.C. -- Symptomatic of today's politically polarized environment in the U.S., Democrats and Republicans express substantially different levels of confidence in colleges and universities. The 56% of Democrats and Democratic-leaning independents who have a great deal or quite a lot of confidence in colleges is more than 20 percentage points higher than the 33% of Republicans and Republican-leaning independents who hold that same view. Please tell me how much confidence you, yourself, have in colleges and universities -- a great deal, quite a lot, some or very little? The current survey marks the first time Gallup has included "colleges and universities" in its confidence in institutions format, so there is no historical trend. However, a recent report from Pew Research Center measuring partisan responses to a question about colleges and universities' effect on American life found a substantially widening partisan gap between 2015 and 2017. Republicans' positive answers nosedived, while Democrats' responses stayed the same -- and very positive. Thus, at the current time, both the Pew and Gallup results show a wide partisan gap in views about U.S. colleges. To find out what is behind these differing views of higher education, Gallup's study asked those who hold each position to provide their reasons. Americans who expressed a great deal or quite a lot of confidence in colleges and universities were asked to explain why they feel that way, and those with some or very little confidence were asked to explain their position. Gallup coded these open-ended responses into categories. The most important distinction in partisan explanations for attitudes toward U.S. colleges is on the negative side of the equation. Republicans are not only less confident than Democrats about colleges and universities in general, but the reasons Republicans give for these attitudes differ from those provided by the smaller group of Democrats who are negative. Republicans with low levels of confidence in colleges are most likely to cite their belief that colleges and universities are too liberal and political, that colleges don't allow students to think for themselves and are pushing their own agenda, or that students are not taught the right material or are poorly educated. In short, Republicans with low confidence tend to see the world of higher education through distinctly political eyes. By contrast, Democrats with low confidence in U.S. colleges are much more likely to cite issues dealing with practical aspects of higher education -- saying colleges are too expensive, are not well-run or have deteriorating quality, or that college graduates aren't able to find jobs. Few Democrats join Republicans in citing colleges as too political or citing specifics in the ways students are taught. What are some of the reasons why you do not have a lot of confidence in colleges and universities? The same partisan divide does not exist among those with high confidence in colleges and universities. Few meaningful differences appear in the explanations Republicans and Democrats give for their positive confidence levels. Among the top reasons for expressing high levels of confidence in these institutions are: 1) personal positive experiences with colleges and universities, 2) the belief that colleges are essential for the nation, 3) the belief that colleges are doing a good job of educating students and 4) the belief that a degree is necessary to get a better job. Smaller percentages of both Republicans and Democrats with positive confidence in colleges cite views of the advanced nature of U.S. colleges, the idea that college is important for students to have better opportunities, and the idea that colleges teach students to have open minds and to see different points of view. What are some of the reasons why you have a lot of confidence in colleges and universities? The finding that U.S. adults are increasingly divided along partisan lines on various issues is no longer new or surprising. This divide has now crept into views of higher education, likely exacerbated by several high-profile student protests that have spurred debates about free speech and contentious choices for speakers on campus. It could be the case that the frequency and coverage of these issues have contributed to the partisan divide, or that they have helped expose a divide that may have already been present. The effect of this divide on views of higher education -- a pivotal element of the American dream for so many -- raises questions about the future of higher education in this country. To what degree will diminished confidence in higher education among Republicans lead to decreased public support and funding for colleges and universities? Or, will Republican families be less likely to send their children to traditional colleges and universities, and instead seek other ways to educate them? Will various colleges and universities begin to align their brands and curricula increasingly along party lines? Is there any hope that this partisan divide on views of higher education will diminish -- and if so, what would bring that about? The Pew trend data show that Republicans started to sour on higher education a few years ago -- so just as this souring has been relatively recent and significant, it's certainly possible it could swing back in a more favorable direction. If that happens, it will hinge primarily on changes in Republicans' views of whether higher education is too political and too liberal. Read more on this topic: Higher Education: Drop the Term "Liberal Arts"
Engage students to prepare them for great jobs and great lives. Gallup provides the tools to help students succeed in university and beyond. Results for this Gallup poll are based on telephone interviews conducted Aug. 2-6, 2017, with a random sample of 1,017 adults, aged 18 and older, living in all 50 U.S. states and the District of Columbia. For results based on the total sample of national adults, the margin of sampling error is ±4 percentage points at the 95% confidence level. The sample sizes for the four groups of Republicans and Democrats based on their confidence levels in colleges and universities vary from 316 to 145 respondents. For results based on these samples, the margin of sampling error ranges from ±6 percentage points to ±8 percentage points at the 95% confidence level. Democrats have become increasingly likely to describe their economic views as liberal. 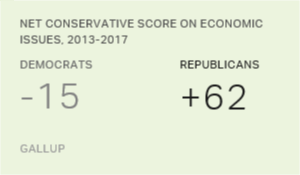 Republicans' economic conservatism has waned a bit since the early Barack Obama years but is stronger than during the George W. Bush era. 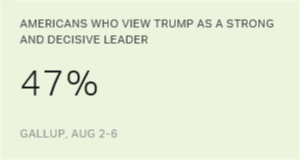 Perceptions of President Donald Trump's leadership skills have eroded as his job approval rating has edged down, but less so among Republicans.